What Is a Main Circuit Breaker? Your electrical panel is full of circuit breakers, running from top to bottom of the service panel. For the sake of convenience, the breakers are usually numbered and mapped, with the odd-numbered breakers running down the left side of the panel, and the even-numbered circuits along the right. But sitting atop both rows of branch circuit breakers there is a single larger circuit breaker that is usually located dead center in the panel. In most installations, this larger breaker is located at the top of the panel, but depending on how the main service panel has been installed, it could be at the bottom, or even at one end of a panel mounted sideways. This large circuit breaker is known as the main breaker, and it plays a crucial role in the electrical system by offering the means of disconnecting power to the entire circuit breaker panel and hence shutting off power to the entire house. What Is the Difference Between the Main Breaker and Branch Circuit Breakers? The main circuit breaker is really no different than any other breaker, but it is designed to handle the large amperage load of the main feeder wires bringing electrical power to the house. For this reason, it will be by far the largest breaker in the box in terms of amperage rating. In a few older homes, the main breaker may be rated as low as 60-amps, but it's much more common for the main breaker to be rated for 100-amps, 150-amps, 200-amps—or even more in a few very large homes. Your main service panel is designed to bring 240 volts of power into your home via two main service wires, each carrying 120 volts of current. Inside your service panel, these service wires connect directly to the main breaker, which then distributes power down through two individual hot buss bars in the service panel. The individual circuit breakers for branch circuits will receive their power by connecting to one or both of these hot buss bars. Circuits for 120-volt circuits connect to one buss bar; circuits for 240-volt circuits connect to both hot buss bars. Branch circuit breakers are designed to shut off power to individual circuits if they overload by trying to draw more power than the wires can safely handle, and the main circuit breaker is much the same. The main breaker shuts off power to the entire house if the overall load demand grows too high or if there is another serious problem in the electrical system. Usually, these problems involve momentary power surges, but sometimes there may be system problems that will need to be diagnosed. It is fairly rare for the main circuit breaker to "trip," because usually, it is individual circuit breakers that trip long before there is a need for the main breaker to shut off. Shut off each individual circuit breaker in the panel, one at a time. Then flip the lever on the main circuit breaker to the OFF position. When it comes time to turn the power back on, begin by resetting the main breaker to the ON position, the turn on each individual circuit breaker, one at a time. The goal here is to avoid sudden power demands on the main breaker. First, turn off all the individual circuit breakers controlling branch circuits. This is done to ensure that circuits driving motors do not all activate at the same time when you reset the main breaker. It's much safer to turn on individual circuits one at a time after resetting the main breaker. Reset the lever on the main breaker to the ON position. When resetting any breaker, stand off to the side of the panel when flipping the lever. It's advisable to wear safety glasses and turn your head while resetting any breaker. By doing this, you will protect yourself from any possible electrical flash or sparks. The chances of this happening are remote, but such episodes have been known to occur. Turn on each individual circuit one at a time by resetting its lever to the ON position. The idea here is to avoid dumping the entire power load on the main breaker all at once. 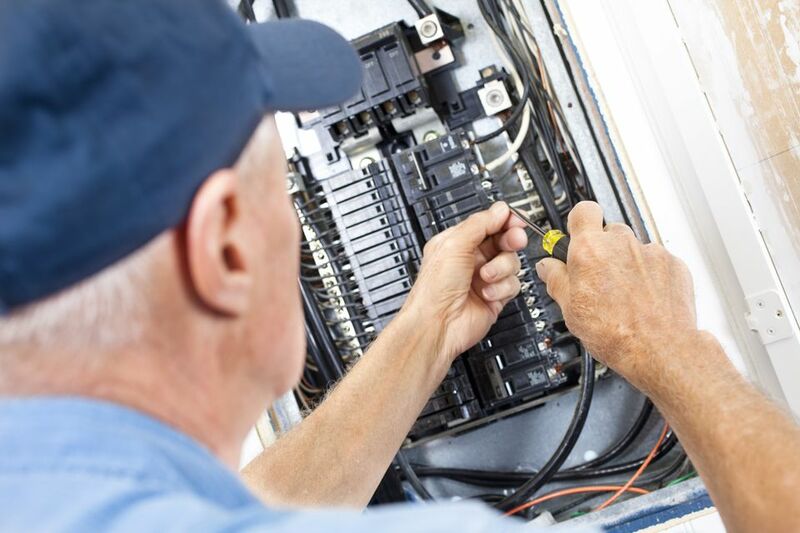 Always practice electrical safety while turning on and off circuit breakers and working in an electrical panel. Usually, the main breaker trips due to a temporary issue and resetting it will solve the problem. but if the main breaker trips again, or trips repeatedly, you are well advised to call in a professional. The problem may involve a short circuit in the main panel, a failed main circuit breaker, or another serious problem. What Is a Circuit Breaker Panel and How Is it Fed? What Is a Single-Pole Circuit Breaker? What Are Double-Pole Circuit Breakers?